John Norwood, a resident of College Point, Queens, has been making sculptures and paintings since attending the Art Institute of Chicago in the 1950’s. He has maintained a singular vision while working for nearly 20 years as the head model maker for a leading architecture firm and raising a family. His materials, whether through impulse or necessity, are the everyday objects he finds around him–cigarette butts, coffee cups, wood scraps, Styrofoam packing materials and remnants of models. He throws nothing away and eventually everything makes it into his art. Dating from the late 1960’s to the 80’s, Mr. Norwood created over two-hundred meter square paintings. These paintings represent many of the trends and influences that inhabit the complete body of work. The gray landscapes–the first pictures he made following art school–are based on a trip to Europe. The series continues with two self-portraits, several works in which he responds to paintings by other artists such as Barnett Newman and Mark Rothko, and constructions made from bits and pieces from Norwood’s life, such as remainders from an office renovation. Many of the paintings have been worked on over the course of several years. In honor of his 50th birthday, he made a series of 50 Plexiglas boxes. Each box has been assembled, then painted or manipulated. 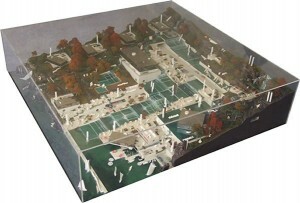 Many contain the remnants from specific model projects Norwood collected during his time as an architectural model maker. Scale is an important aspect of Norwood’s work. Many of the pieces are based on specific physical dimensions that he explores in all its possibilities, such as the square meter. He has created several wall pieces based on reproducing an image then enlarging it ten times greater, then again ten times more. These simple structures and clean proportions provide an orderly framework for the ensuing flood of ideas.